What Do You Really Do With A Zombie Axe? 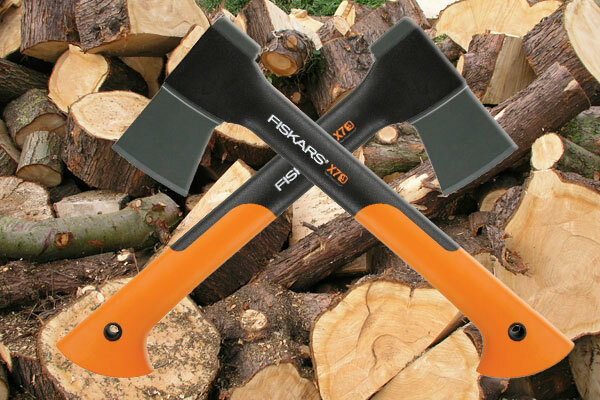 The axe you see pictured above has been getting a lot of press lately. 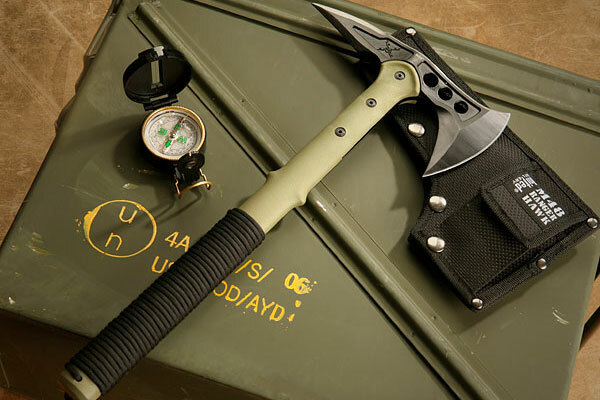 As far as I can tell, the whole story started when the fun-stuff site ThinkGeek featured the axe as the M48 Range Hawk Axe, which they suggest is designed specifically for “quiet zombie killing.” Then numerous other sites picked it up, partly because of ThinkGeek’s catchy sales pitch and partly because it’s just a pretty cool-looking axe. I have zero problem with a little zombie geekery, but I couldn’t help but think: who actually makes this thing, and what’s it really designed to do? 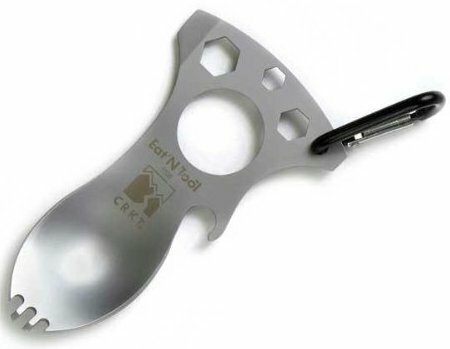 CRKT’s Eat N Tool is the perfect multi-tool for a bachelor. No more washing a spoon and a fork, no searching for a bottle opener for your beer, and no more hunting for a screwdriver to pop the top off that old can of Hershey’s coco in the back of the cupboard when you need chocolate. 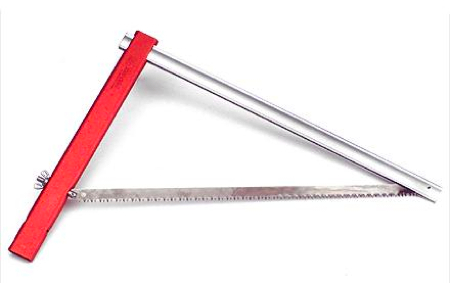 How many Toolmongers own a folding saw? 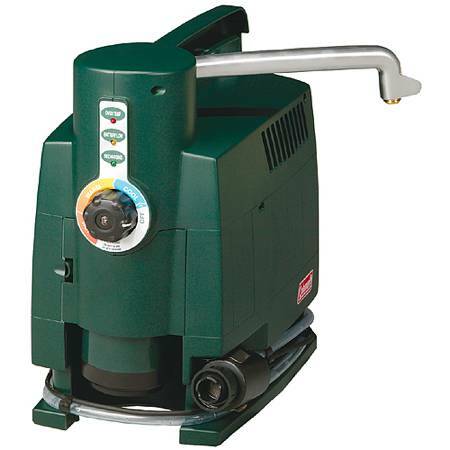 I haven’t seen them very often, but the Sven 15″ from REI is one I’m thinking of putting in the toolkit in our truck. With an aluminum frame, it weighs only 15 oz. and reviewers say it’s so effective and easy to use (one said “like a deli slicer on a salami”), you have to take special care to keep your fingers out of the way. Fortunately the blade folds into the handle for storage. We’re in the middle of camping season for many Toolmongers, and an inexpensive magnesium firestarter is always handy to have — especially for under $5. SE’s version comes with a magnesium rod and a striker that is flat on one side and serrated on the other. 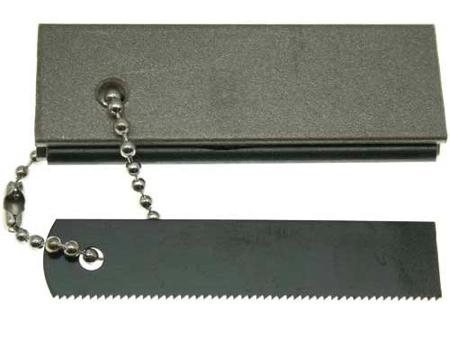 Most folks recommend using the flat side for shaving a small amount of magnesium into the pile of Stuff You Wish to Burn, then using the serrated edge to strike the rod. It’s safe, lightweight (0.6 oz), and at 2.75″ fits easily into your pocket — so whether you’re celebrating the fourth, camping with the family, scouting — it’s not a bad idea to keep one of these around. Forget cold showers and stream water from a tin freakin’ cup. Coleman has rendered the tankless water heater portable, making hot water easily available anywhere you’re willing to haul their little water on-demand unit. Of course, if you’re one of the people who’ve been completely without power for a day or more over the last few weeks due to ice, other less camping-oriented uses may pop in your head as well. I was searching the Internet the other day for information on forming leather pump cups (related to my airgun obsession) and found the Classic Camp Stoves forum. 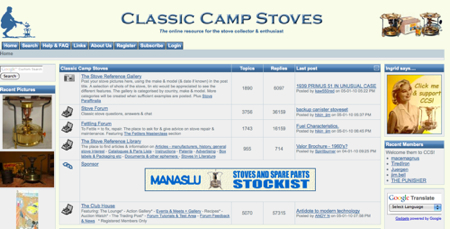 The forum is dedicated to the restoration and collection of classic camping stoves and has a subforum on practical repair (“fettling”). There are many excellent pictorial postings explaining exactly how to disassemble, repair, make, polish, etc. old camping stoves. The post on making leather cups was quite helpful to me. Unfortunately I threw out my 50’s vintage gas stove over a decade ago and I now regret it, as I could have gotten it back into working condition based on the information presented. It was also nice to find a hobby narrower than my own. 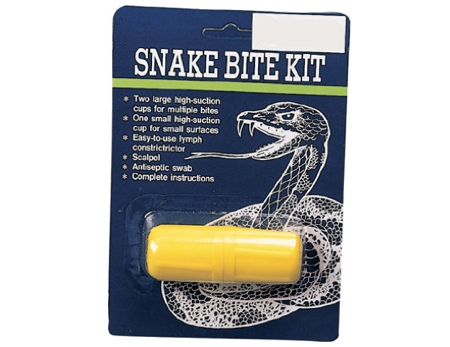 The low mortality rate [of bites] is based on prompt emergency medical treatment and anti-venom availability in areas with large populations of venomous snakes, ie. Southern California, Texas, Florida. While poking around recently in REI’s camping gear, I saw something that at first made me scoff: a $55 “stormproof” camping lighter, right next to the five-buck “stormproof” matches. But then I checked out the specs: the Windmill Delta Stormproof Lighter uses a catalyzer coil that will hold a flame even in 70 – 80 mph winds. 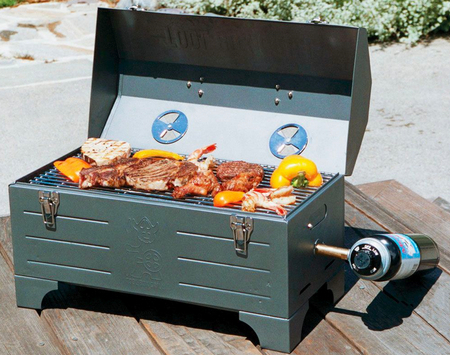 We’ve heard a lot about portable grills that fold like briefcases or look like Crock Pots, beer kegs, woks, or UFOs. Is the Tool Box Grill just another novelty, or is it a decent cooker? The construction is mostly sheet metal with a porcelain grate and shield (the heated components). The manufacturer’s site says the 10,000 BTU stainless steel burner tube provides “even cooking heat,” though user reviews cast some doubt on this. The grill’s dimensions are 19.5″ x 8.75″ x 10.5″, or 173 sq. inches of cooking surface, which is a fine size for a portable grill. 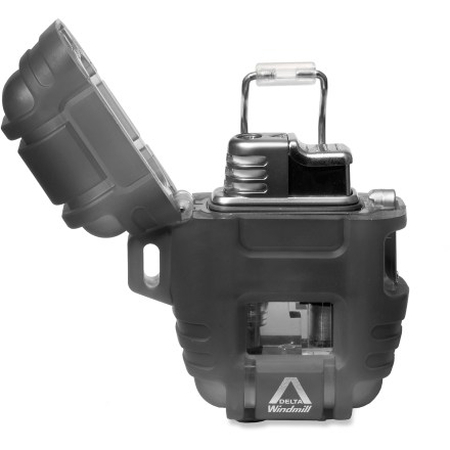 Its design lets you store tools and propane inside the box and, at 19 lbs., you can carry the whole thing in one hand. But while a portable grill should be lightweight, the flimsy construction might require some extra care. Also, we found conflicting information about the propane tank; the manufacturer says the grill uses a standard 1lb. “camping” style canister, while a reviewer at About.com notes that it actually takes the 14 oz. disposable bottle found in most stores’ tool section. At around $65, this grill could be a good grab for camping, picnics, and cookouts while traveling — if the griller treats it gently and doesn’t mind low heat. Let us know what you think in comments.